It’s been a very busy few months for BJ Sherriff, with us attending no less than three top notch conventions since August. First up was our own annual charity BEE Fayre in August, held in aid of Bees Abroad, Bees for Development, the Bumblebee Conservation Trust and Cornwall Wildlife Trust’s Bee Kind Appeal. 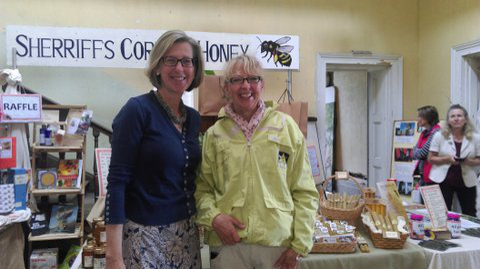 The fayre saw bee enthusiasts from far and wide descend on the Enys Gardens Estate in St Gluvias, Penryn, for two days of bee-focused activities, talks, demonstrations, workshops and fun. This year’s BEE Fayre was a huge success and not only raised money for the chosen charities, but also helped raise awareness about bees and their plight. Next on our events calendar this year was the 85th National Honey Show held at Sandown Park Racecourse, Surrey, in October. It’s the first time that the National Honey Show has been held at Sandown Park and the splendid new venue afforded more space for traders, as well as enabling all of the many activities to be housed under one roof. The largest, most prestigious honey show of its kind in the world, the National Honey Show promotes the highest quality honey and wax products with international classes, lecture convention, workshops and a beekeeping equipment trade show. Last, but certainly not least, was the Farm Business Innovation Show at the Birmingham NEC in November. Featuring 200 seminars and 400 exhibitors over two days, there was a huge amount to get involved with at the show this year. The Farm Business Innovation Show is the diversification and innovation event for farmers and landowners to make more money from their land.